“I” could be for many things, in my A-Z of Japan. I could go all traditional and write about ikebana (生け花 / flower arranging), or perhaps reminisce about the time I did ichigo-gari (strawberry picking) with my friends in Japan. But, after much deliberation, I’ve decided that “I” should be for a word that visitors to Japan usually learn quite early on, because it is a word that is key to socialising in Japan. An izakaya (居酒屋) is basically a Japanese pub-restaurant, but it’s very different compared to British pubs. Izakayas come in all shapes and sizes, from tiny local shops to massive, multi-floored chains (where you can get lost just trying to find the loo). When you enter an izakaya, you will be greeted with a shout of “Irasshaimase!“, welcoming you into the establishment. You will then be met by a waiter or waitress (quite often these will be young people, like university students), who will ask you how many people you need a table for (“nan mei sama (desu ka)?”). You can reply by saying the number of people (e.g. “futari desu”, “san-nin desu”) or you can just hold up the appropriate number of fingers (especially if it’s just two or three). I thought this seemed so rude at first, but I’ve seen a lot of Japanese people do it, so I think it’s ok! The server will then show you to your table, which will almost always be a private room or booth. Going to an izakaya can be much more intimate than going to a pub in England. Although things do get rowdy, you can usually hold a conversation and relax in your own space, without having in interact with any other customers. In most places, you will be required to take off your shoes. This might happen at the entrance, in which case you will put your shoes in a locker and take the key to the table with you. Sometimes you just slip your shoes off outside the room/booth, and leave them there. There are some izakayas where you don’t have to take your shoes off, though. Usually, if you do take your shoes off you will be sitting on the floor, and if you don’t take your shoes off you will be sitting on chairs. You can take your bags and coats into the room, and there are often hangers or hooks for you to hang your coats up on. These screens are usually all in Japanese, so they can be really good practice for your Japanese studies! They do have a lot of pictures though, so that’s useful if you can’t read the kanji. If there’s no touch screen, there will be an ordinary paper menu. In a really small, local place, this might just be a page of Japanese writing. However, in most izakayas in towns, the menu will feature a lot of glossy pictures. If you can’t find something you want on the menu, you can always press the buzzer and ask the server if they have what you’re looking for. Some izakayas do have English menus, especially in big cities. You can always ask: “ego no menu ga arimasu ka?”. There are some dishes you will always find on izakaya menus, including edamame (枝豆 / soybeans) and yakitori (焼き鳥 / grilled chicken). Some restaurants have local dishes or specialise in a certain kind of food (fish, chicken , beef), and you can find some really interesting dishes on the menus of different izakayas. You can often find Western food too, like French fries and pizza, but I don’t personally see the point in eating that kind of food in a Japanese restaurant. Also, Western food in an izakaya is often not that good quality, and you’d be better off going to an Italian or American restaurant (of which there are plenty in Japan). Whilst izakaya food is great, and usually quite cheap, I have to say, from experience, an izakaya is not the best place to eat if you are a veggie, have allergies, or are a particularly fussy eater (especially if you have trouble reading Japanese). When eating in an izakaya, it’s important to remember that your bill will probably be split evenly at the end of the night. It’s unusual to separate the bill into “who ordered what”, because the food is usually shared. There are always lots of small plates on the izakaya table, and it’s normal to share out every dish that comes, and to continue picking from what’s on the table. Of course, it depends on the group of people you go with, but I think it’s pretty rare to order just what you want to eat and keep it all for yourself. 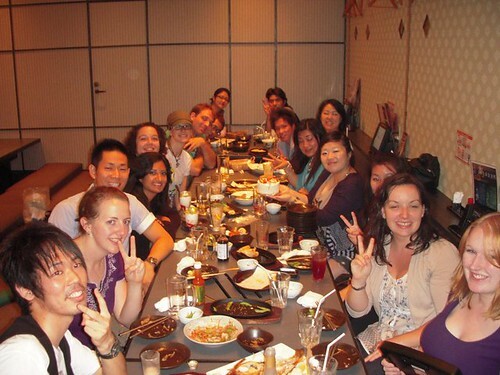 Eating in an izakaya is a really fun, group activity. The private rooms are really relaxing, and I have often seen my friends stretching out on the floor and really chilling out after a couple of pints of “nama biru” (tap beer). Izakayas are usually open from early evening until the early hours of the morning and, believe me, you really can spend hours in your room without anyone asking you to leave or bothering you. 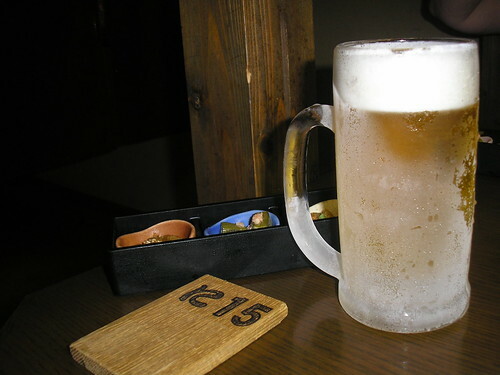 Of course, one of the main purposes of going to an izakaya is to drink alcohol. As well as beer, there are usually many other kinds of drinks, including sake (“nihonshu” / 日本酒), shochu (焼酎) and cocktails. Izakayas serve non-alcoholic drinks, too. A popular choice is always oolong-cha (oolong tea), but they also serve cola, orange juice and sometimes non-alcoholic cocktails. Hej love your blog. Did you sign up for Google+? It would be nice to have you in my Japanese circle. Thanks for stopping by. I am on Google+ but haven’t been posting much there yet. I probably should, but I haven’t got the hang of it yet. I’m much more active on Facebook and Twitter, so feel free to follow me there, or subscribe to the blog by email, if you want.